Today’s nail art starts with two coats of Zoya Jordan which was sent to me as a press sample. 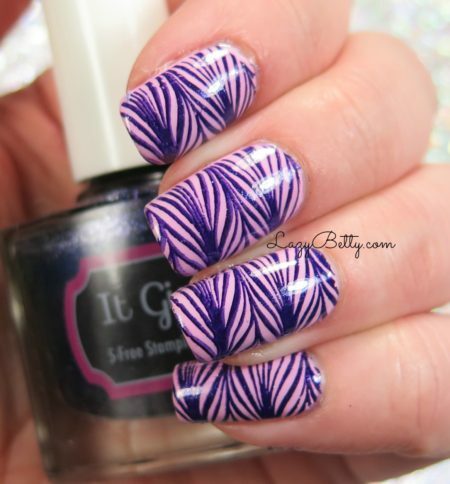 I used It Girl Amethyst to stamp this faux watermarble nail art on my nails. The is probably one of my favorite Bundle MonsterBundle Monster plates I own. It allows a lazy schlub like me to pretend to do watermarbles! Yay me! Happy Friday Eve!! Today’s nail art starts with two coats of Zoya Tina which was originally sent to me as a press sample. 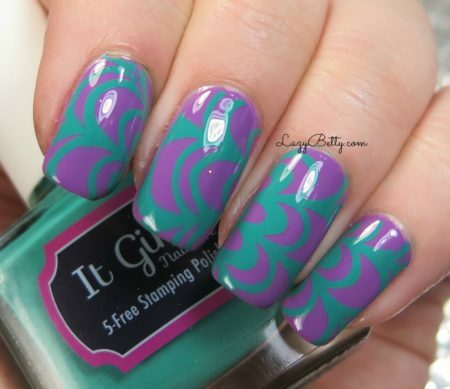 Then, I used It Girl Marina stamping polish for this faux watermarble design from a Bundle Monster plate. I’ve never been able to master real watermarbling, so I have to succumb to the cheater’s way. 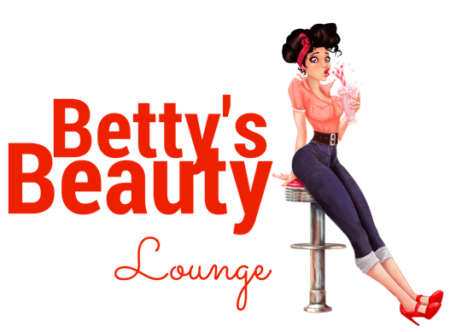 :) #lazybetty right? 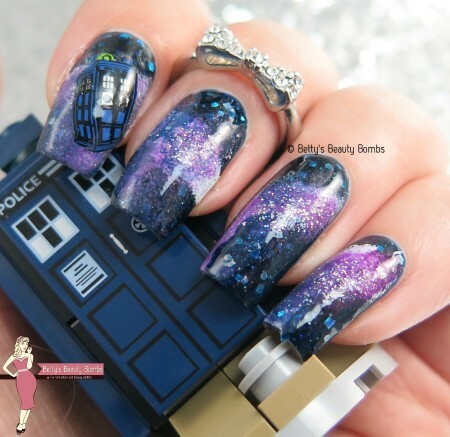 Today I have a swatch and nail art for you today! I used GlitterDaze I Need Kelp which is from the February 2016 subscription box. This beauty is a mint crelly with gold glitters in it. I think it’s very pretty. To add a little nail art on top, I used Bundle Monster Gold and this Egyptian style design from It Girl Nail Art IG107. 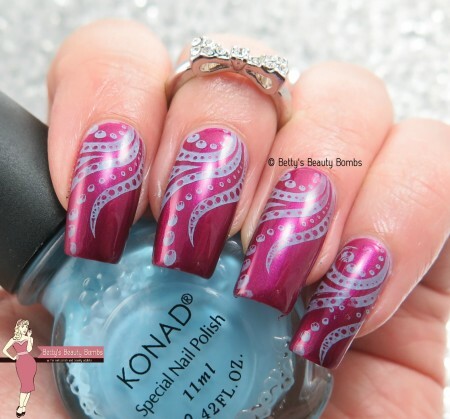 Today’s nail art uses Bundle Monster plate BM-XL210 which is one of my favorite plates that I own. I started with three coats of My Indie Polish Insert Name Here which is a lovely light lavender. I used Mundo de Unas Blue Navy as my stamping polish. Today’s post is an antique nail art look starting with two coats of Marc Jacobs Petra. I picked this design from It Girl Nail Art Plate IG106 and used Bundle Monster Black to stamp. Today’s nail art look is subtle, but I really like it. I started with two coats of Zoya Eastyn which was sent to me as a press sample. 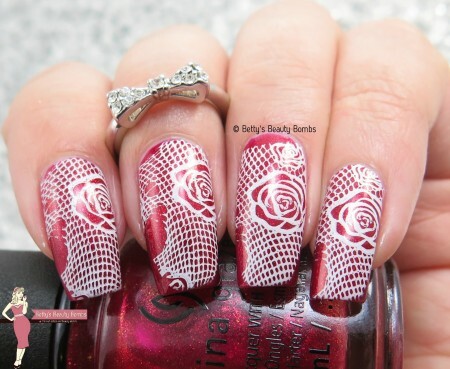 I used this filigree design from It Girl Nail Art Plate IG106 which was also sent as a press sample. I used my Bundle Monster silver stamping polish which I have seriously been neglecting. I usually reach for Konad or Mundo de Unas but I really wanted to stamp with silver. Turns out, my only silver stamping polish is Bundle Monster…and I forgot how good it is! It stamped just as well as the others so I don’t know why I’m always ignoring it. Today’s post is for the Crumpet’s Nail Tarts Challenge. This week’s prompt is “Things that Fly”. I was racking my brain to think of what I should do. 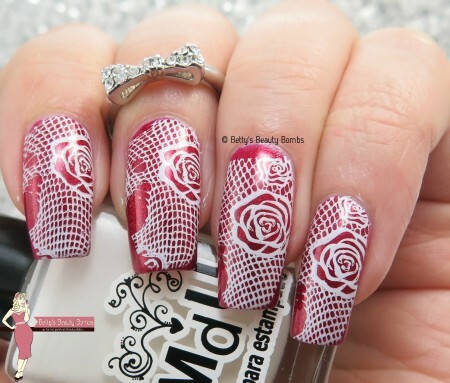 I really want to break out of my go-to method of stamping something. I can’t freehand at all and I didn’t even know what I’d draw if I could. I was at a total loss. 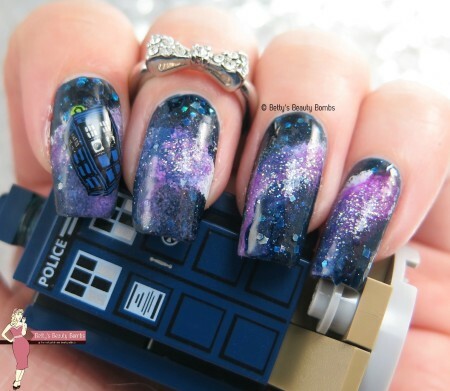 Then, I realized that the TARDIS flies! Duh! I suddenly got very excited to do this prompt. I did a galaxy mani first (thusly breaking out of my stamping rut). To make the TARDIS, I made a decal using the Bliss Kiss Simply Neat Miracle Mat. (I did a full review on this awesome mat earlier this week.) The TARDIS can be found on My Online Shop Stamping plate Plate XII. A lot of polishes went into the making of this mani. 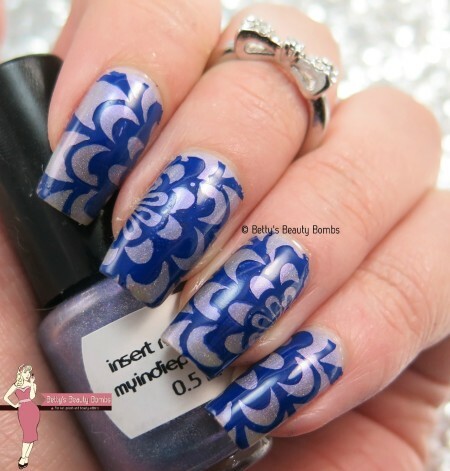 Today I have some blue on blue two tone stamping to show you! I started with NYC Sea of Diamonds which was originally sent to me as a press sample. Then, I used Konad Light Blue to stamp this flowery-geometric design from Bundle Monster plate BM-XL206. Today’s black and teal nail art starts with three coats of Seven Psychedelic which was originally sent to me as a press sample. Then, I used Mundo de Unas Black and Bundle Monster plate BM-XL206 to stamp this flowery design on top. I know this isn’t holiday nail art…which is probably what you expect to see all this week! But I wanted to mix it up and try to throw something unexpected out there today. 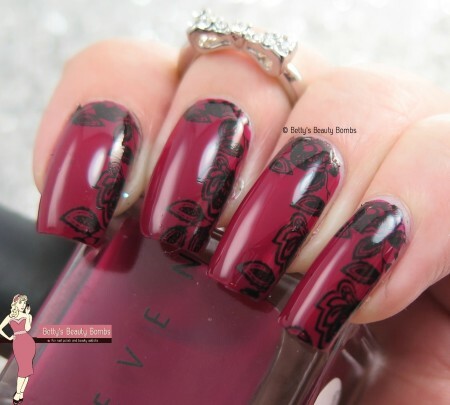 For this black flowers nail art, I started with two coats of Seven Cosmetics Cherry on Top. Then, I used Mundo de Unas Black and a design from Bundle Monster plate BM-XL206. I really like the partial design this stamping design gives. It makes the flowers a bit of an accent rather than the focus of the nail. 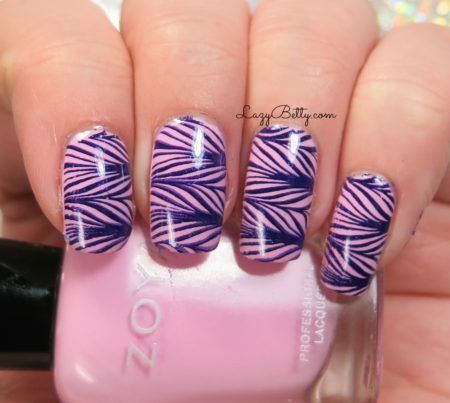 Today’s nail art looks is one of my favorites that I’ve ever done! It’s simple and clean and pretty. I started with two coats of Seven Cosmetics Blowing Smoke which was originally sent to me as a press sample. I used Mundo de Unas Red to stamp this flowers design from Bundle Monster plate BM-XL206. Today’s mani is for the Crumpet’s Nail Tarts challenge. 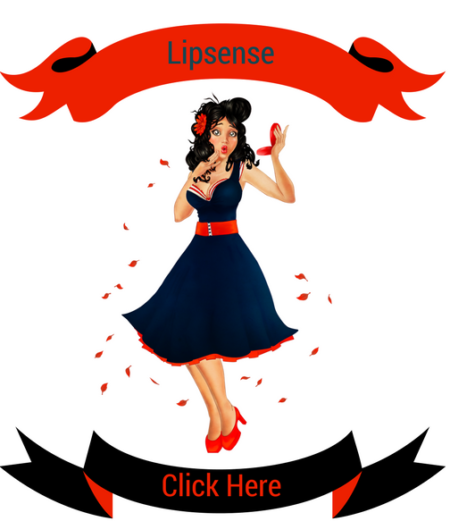 This week’s prompt is Christmas! I started with two coats of NYC Ruby Slippers which was originally sent to me as a press sample. Then, I used Mundo de Unas Military Green and the Bundle Monster + Nailstamp4fun collab plate to create the star design. This nail art starts with two coats of Sally Hansen Spice Age which was originally sent to me as a press sample. Then, I used Mundo de Unas Lilac to stamp a design from Bundle Monster BM-XL206 which is a collaboration plate with Nailstamp4fun. This mani starts with one coat of Pretty Serious Absence (yes! One fabulous coat!) Then, I put Sally Girl Bling Snowman on top. The effect is marvelous! Then, I thought I would stamp a subtle design on top. I used Mundo de Unas Black and a design from Bundle Monster BM-XL209. This mani starts with two coats of Fairytale Finish Crystal Ball which is from the November Neverending Fairytales subscription box. 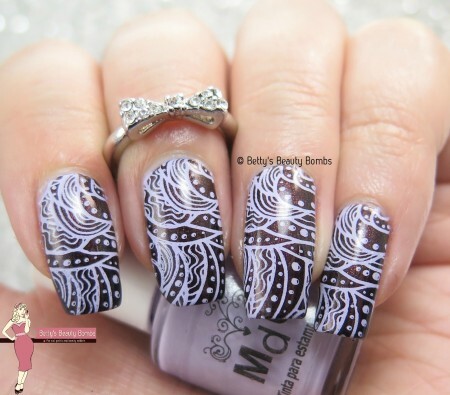 I used Mundo de Unas Mexican Pink to stamp this paisley nail art design from Bundle Monster plate BM-XL209. This plate is a collaboration between Bundle Monster and an amazing blogger from Lucy’s Stash. Today’s mani starts with two coats of China Glaze Don’t get Elfed Up from the Cheers! collection. (This one was originally sent to me as a press sample.) Then, I used Mundo de Unas Red and a design from Bundle Monster Plate BM-XL208. Today’s mani starts with an impulse buy at the counter of Sally Beauty Supply. I saw this adorable little polish called Sally Girl Peppermint and just couldn’t help myself! I’m also pretty sure that it’s scented as peppermint but maybe my mind was playing tricks on me? I did a little stamping on top using the Bundle Monster and Lucy’s Stash collaboration plate. The stamping polish was Konad Black. Here is a plain swatch of Sally Girl Peppermint. I did need to do three coats for full opacity. This polish perfectly captures peppermint! 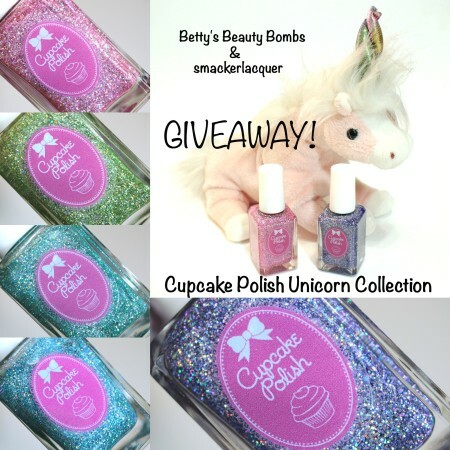 Author AnnePosted on December 1, 2015 December 22, 2016 Categories UncategorizedTags Art, Bundle Monster, Konad, Sally Girl, StampingLeave a comment on Peppermint Nails Fun! Today’s nail art starts with two coats of Color Club Portfolio which is a purple and green duochrome. 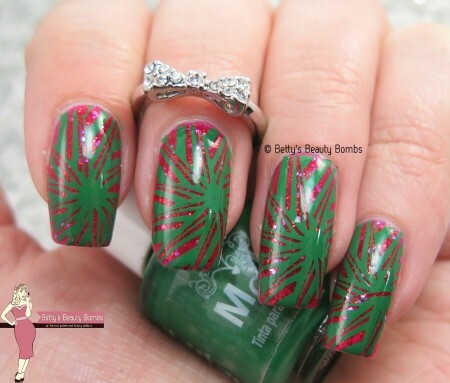 Then, I used the Bundle Monster and Lucy’s Stash collab plate to stamp this leafy design on top. I used Mundo de Unas Black as my stamping polish. Today’s nail art starts with two coats of Enchanted Polish Garland. 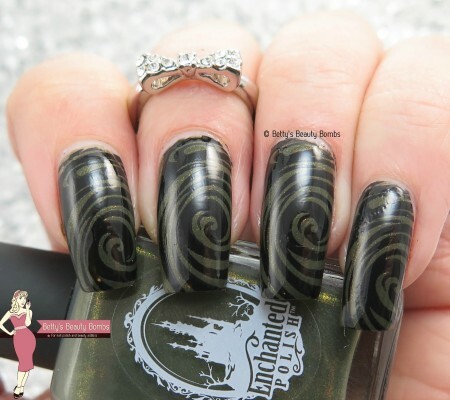 I used Bundle Monster plate BM-XL210 and Konad Black to stamp this swirly design on top. Today’s nail art starts with three coats of China Glaze Ugly Sweater Party. I used Mundo de Unas Metallic Purple to stamp a chain design from Bundle Monster BM-XL-208. Today’s mani starts with two coats of Enchanted Polish Pinecone which is a lovely dark creme. Then, I used a faux watermarble design from Bundle Monster plate BM-XL210 with Konad Yellow. Today’s mani starts with two coats of China Glaze Brand Sparkin’ New Year from the Cheers! collection (and was originally sent to me as a press sample). Then, I used this fabulous brushstroke-looking design from Bundle Monster BM-XL208 and Mundo de Unas Lilac to create this look. Today’s mani starts with two coats of China Glaze Peppermint to Be (which was originally sent to me as a press sample). 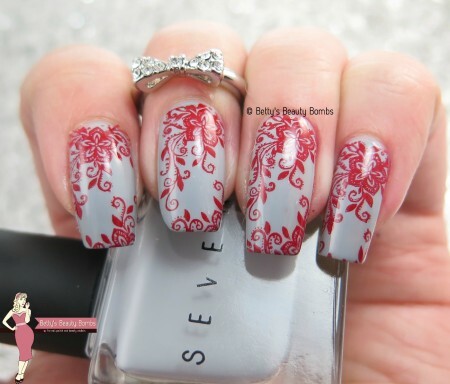 The stamped polish was Mundo de Unas White and the stamping plate was Bundle Monster BM-XL208. Today’s mani starts with two coats of China Glaze Better Not Pout which is from the new Cheers! holiday collection (and was originally sent to me as a press sample). I used Konad Light Blue and a design from Bundle Monster Plate BM-XL-208 to create this look. Today’s nail art starts with two coats of China Glaze Son of a Nutcracker (which is from the new holiday Cheers! collection and was sent to me as a press sample). Once dry, I used Konad Black and Bundle Monster plate BM-XL208 to stamp this lacy teardrop design. I let myself get a little rusty with my stamping! I couldn’t believe how crooked these turned out! I guess if you don’t do something for a while, the skill does atrophy! This was the first nail art I’d done in at least a week because I’d been feeling ill. I was still painting my nails, but didn’t have the energy for art. My swan dive back into nail art was a bit more of a belly flop! LOL! But at least I’m back in the pool, right? ?